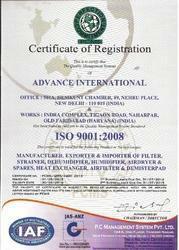 Advance International (An ISO 9001: 2008 certified company) is originated in the year 1978. We are one of the leading manufacturer and exporter of Industrial Filters And Dehumidifiers. Our comprehensive range of these products includes Industrial Filter, Air Dryers, Strainer, Demister Pads, Heat Exchangers, Dehumidifiers, Moisture Separators, Activated Carbon Filters, Clean Room Projects, PP Sintered Filter Candles, Activated Carbon Blocks Filters, Laminar Flow Bench, Cartridge Filters For Powder Coating, Chilling Plant, Industrial Tile, Porous Plastic Sheets for Fluidizing etc. We are supported with a spacious infrastructure facility that is spread across a wide area. 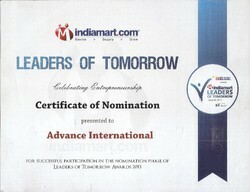 Our organization is supported by a team of expert professionals who are highly qualified and experienced. Our range is manufactured using high quality materials and according to the international quality standards. We also check the quality of our range on various parameters to offer an unmatched range to our clients. Under the guidance of our marketing coordinator, Ms. Promila Sharma, we are able to offer a superior quality range to our clients. His industry experience and ability to cater varied demands of our clients helped us in offering an unmatched range to our clients. We have our sales / Service / Dealer network in major cities such as Delhi, Mumbai, Pune, kolkatta, Hyderabad, Chennai, Ludhiana, Lucknow, kanpur, Ahmedabad, Bhubaneswar, Cochin, Goa, Nagpur, Patna,Ranchi, Raipur, Jaipur, Vadodra, Chandigarh and Gauhati. Trading, Importer and Exporter of Industrial Filters And Dehumidifiers. We have installed highly advanced and the latest tools and machinery in our manufacturing unit. This machinery is regularly lubricated and updated as and when required to offer an unmatched range to our clients. Our manufacturing unit is managed by a team of expert professionals who are highly qualified and experienced. They use best quality materials for manufacturing a wide range to our clients. To consistently develop and re-engineer services and activities to meet and exceed our customer's requirements.